Yoshie Sakai is a multidisciplinary artist, working in video, installation, performance, and sculpture. She received her BFA from California State University Long Beach and her MFA from Claremont Graduate University. Recent solo exhibitions include Antenna in New Orleans (2016) and Groundspace Project in Los Angeles (2017). She attended the ACRE Residency Program (2016), the Skowhegan School of Painting and Sculpture (2014), and received the 2012 California Community Foundation for Visual Artists Emerging Artist Fellowship. Her work has been shown throughout the United States in film festivals and art exhibitions from Los Angeles to Miami, as well as internationally in Cambodia, Canada, and Japan. She is currently preparing for her solo exhibition this September at the Verge Center for the Arts in Sacramento, California. 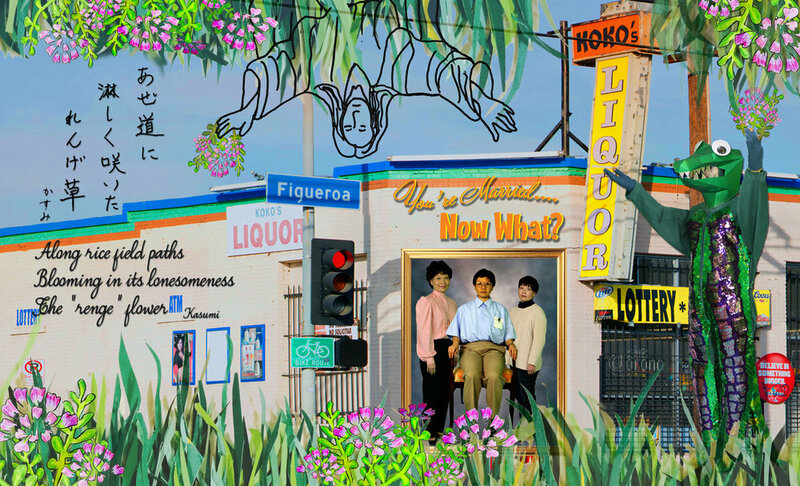 Yoshie Sakai lives and works in Gardena, a city southwest of Los Angeles. Hello Yoshie, can you tell us a bit about yourself, your background, and interests? I am 1.5 generation Japanese American from Gardena, California, a city southwest of Los Angeles with a large Asian American population. I left Gardena after high school to start my first life by attending UCLA, majoring in Communication Studies and Classics (Ancient Greek and Latin) and then to UC Berkeley to pursue a graduate degree in Classics. Leaving the program at Berkeley after one year and suffering from clinical depression and burnout, I moved to Hawaii for five years. There, I worked jobs from helping Japanese tourists in Waikiki to selling cellular phones to becoming an administrative assistant. I enrolled at the University of Hawai‘i at Mānoa in the year 2000 and began taking beginning art courses. This was the start of my second life. I eventually returned to California to pursue a BFA in drawing and painting from California State University Long Beach and eventually a MFA from Claremont Graduate University in 2008. I think that having taken this very circuitous route to find art with all the ups and downs and experiences in between has made me appreciate living in my hometown of Gardena again. What informs my work, which I feel has been the same since I was an undergraduate, is the quotidian, the everyday anxieties, fears, and joys that come from living. My friends, family, coworkers, students… all their concerns and preoccupations become my obsessions, from subjects about death to personal weight management to my current body of work with the soap opera genre. I do believe that I have been making the same work since the very beginning, which comes down to expectations and for the most part, the inability to meet them. I find this to be at the core of everything I have made so far from Come One, Eat All (2007) to KOKO’s Love (2014-present). It could be expectations set by the media and big business, by our families and friends, and by ages and ages of ingrained patriarchy, but this struggle for me to try and meet these unrealistic goals set by others has become a continual lifelong battle. You are usually the only performer in your works even when there are multiple characters, can you tell us the thoughts behind that, and would you consider having other performers in the future? Other than in KOKO’s Love: Episode 2 where the daughter character Yuki meets people in the outside world during her dream sequence in New Orleans, I am the only performer. I do plan on performing all the characters myself because it is in essence a story “loosely” based on my personal family history and narrative, so it made sense and still makes sense for me to be at the core of all the characters. Even in the videos that are not linear narratives like Que Sera, Sera (2011), the fact that I play different individuals adds to the humor and the struggle. Often times I think it would be easier to have actors, because it is difficult lip syncing to all the voices, but it works for me to be everyone at the same time. This means all the characters, at least in KOKO’s Love, will be aging along with my real-life aging. Can you share with us your experience of being a Japanese female artist living and working in America, how does your cultural background influence your practice, and how do you respond to the expectations of being a “model citizen”? Being raised by a very Japanese mother who is “Issei” (first generation) and a “Nisei” (second generation) father who was born and raised here, I find myself very much caught in between, trying to find a place where I fit. In America, I never felt Japanese American enough, as I didn’t grow up doing the activities third and fourth generation friends participated in like being on local Asian American softball and basketball leagues. Also, I would, and still do, watch more Asian television shows than American ones. I also speak Japanese, and many of my friends who are third and fourth generation do not speak the language. Having spent a lot of time with my mother, who was a homemaker all throughout my elementary to secondary school years and who also never learned to speak English well, I really felt more “Japanese” growing up. However, after visiting Japan, I realized that I am very American, that growing up from what I believed was immersion in Japanese language and culture still did not make me more “Japanese”. I really felt out of place and felt I didn’t belong anywhere, so my practice really is a hybrid of all these feelings and points of view. My soap opera KOKO’s Love is my way of trying to carve out a space where my work and I belong. The expectations of being a “model citizen” fits in this in-between space of the push and pull of trying to be perfect and having acceptance by celebrating my imperfections. We are very impressed by how funny yet genuine you work is, we would like to know how does humor play a role in your practice and how do you balance humor so well with serious topics like race, gender, and anxiety? I find humor to be a very important and complicated intersection where all sorts of emotions collide. Humor is also a coping mechanism and necessary life tool for getting through life filled with hardships and injustices. It makes life bearable, although not always accepted. In some cases, for example, I have always had a nervous laugh where I would laugh or chuckle a little after I say something serious or uncomfortable, and I remember I would get scolded and asked why I am laughing when what I said was not funny. But for me it was probably a “bad” habit or necessary one to process the uncomfortable feeling I just spoke about. I feel like the whole soap opera series is one giant nervous laugh of all the wrong and difficult situations we are put through with our relationships with family members, friends, and acquaintances. For me joy and pain are two sides of the same coin, which is humor. I don’t think that something can be funny without understanding or incorporating both aspects. And serious topics like race, gender, and anxiety need humor as a processing mechanism. Humor is also one way of committing things to memory, so if you associate something you want to remember with humor, there is a tendency, at least for me, to not forget something that is significant and shouldn’t be forgotten. Are there any books you have read recently you would like to share? I probably watch more Asian television and movies than read, but I am very much drawn to Japanese literature, especially stories that encompass the observation of daily life, where I find a great deal of comfortable familiarity. Currently I am reading Sōseki Natsume’s I Am a Cat (written 1905-1906) which is about this self-important cat, who is never even given a name by his owner, and recounts stories about his view of human beings and their foibles. At first, this cat only referred to as “the cat” has dreams of overtaking the human race, but as the story goes on, he becomes disillusioned by the life of cats and starts to align himself more with humans. It’s a really fun but realistic and kind of sad look at the ephemeral lives of living creatures. Oh I have so many bad habits, but the two I will mention directly relate to my work and how I work. The first one is binge watching Asian television shows, especially the Japanese dramas with my mother. We find ourselves on some days, sitting for like almost 10 to 11 hours watching a show, and our conversation afterwards is pretty much my mama saying “Wow, we didn’t do anything today except watch TV,” and me responding, “Yeah…, we didn’t do anything today, mama.” But in actuality, it was bonding time with my mother and research for my soap opera project. Research! Yes, it is! The second bad habit is procrastination. More often than not, I can’t make decisions until I have to, as I get stuck inside my head for days, weeks, months, and probably even years if not working towards a deadline. The final decisions are not made until very close to the due date, but because I had been going over the options for so long by thinking about each and every consequence in much neurotic detail that the decision I make in the end is hopefully, the “best” one. I am currently preparing for and excited to be having a solo exhibition in Sacramento in September of this year at Verge Center for the Arts. I plan on transforming the entire space into a KOKO’s Love high school “life” dance of sorts with the premiere of KOKO’s Love: Episode 4. I am also preparing for a group exhibition entitled The Autotopographers in March of 2019 at the John Michael Kohler Arts Center where I will be creating a new installation and some new videos inspired by Sōseki Natsume’s I Am a Cat. There will be video vignettes of the relationship between the daughter Yuki’s character and her mother Keiko, as well as her father Hiroshi from KOKO’s Love. These stories will be told from the point of view of a pet dog that Yuki has been eyeing in the pet store but has not had the privilege of having as a her real pet as of yet. Throughout 2018, I will continue to work on my first artist book with the generous assistance of Antenna, a non-profit literary and visual arts events and education space in New Orleans, Louisiana. The book will be a “Choose Your Own Adventure” type story but KOKO’s Love style.